With the increased sophistication of clients and ease of access of information, it is common for clients to have multiple investment accounts with different product providers or platforms. Thus, the ability to consolidate all investment holdings in one place is crucial for the effective management of a client's portfolio. 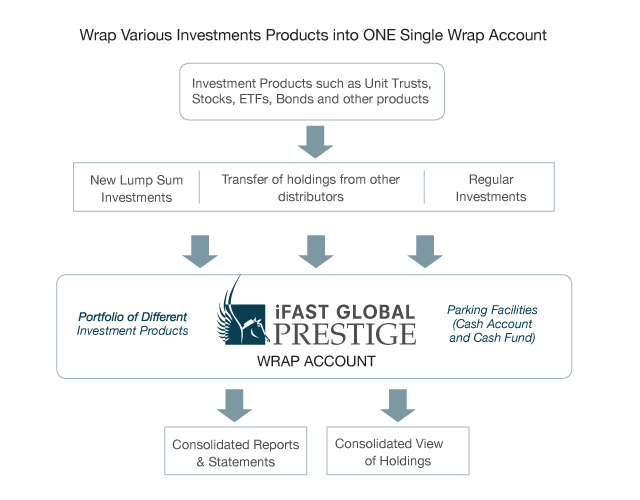 The wrap account allows wealth advisers to wrap all the clients' investments (e.g., funds, ETFs, stocks, bonds, cash and other products) into one account. Clients will be able to view their investment portfolio online through one single platform, 24 hours a day, 7 days a week. The portfolio in the wrap account can be displayed according to product type, asset allocation, geographical classification, currency and others. Wealth advisers are able to have an overall view of the portfolio and make recommendations for the client on an holistic level and manage the portfolio effectively by making changes to the investment allocation into different investment products, asset allocation, switching of funds or rebalancing of portfolio. The Wrap Account offers clients unlimited free switching between unit trusts - so selling from one unit trust and buying into another unit trust will not incur any upfront fee. In return for this ongoing service, wealth advisers can apply an annual wrap fee based on the value of all investment products wrapped in the account. The annual wrap fee will be deducted directly from the portfolio on a quarterly basis. The amount of wrap fee chargeable is directly correlated to the performance of the portfolio. Thus, it successfully aligns both wealth advisers' and clients' interests. By managing all aspects of the financial planning business through one sophisticated platform, wealth advisers are able to manage their clients' assets in a more efficient and effective manner. There are no charges for the opening of the wrap account. Client will get a consolidated report on all investments holdings in the wrap account. Wealth advisers can rebalance their client portfolios at low costs. All iGP wrap accounts are also entitled to unlimited free switching between unit trusts. There is no lock-in period in the wrap account. The funds in the wrap account can be redeemed any time. The annual wrap fee is variable and determined by the wealth adviser, but subject to a maximum cap.